How to recruit referrals with Online Money World ? As stated at the top of our site, Online Money World refers the best paid sites and the best autosurfs. 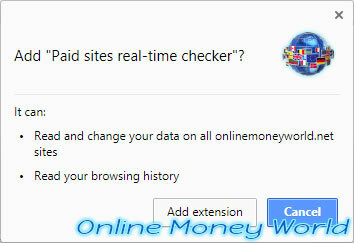 But, to be able to check the status of all paid sites available on the Internet, Online Money World obviously needs you. That's why Online Money World offers you the possibility to add your favorite paid site or your autosurf on our site by adding also your referral link. Thus, you benefit from our SEO to get free referrals on your favorite site and you contribute to the update of our database. 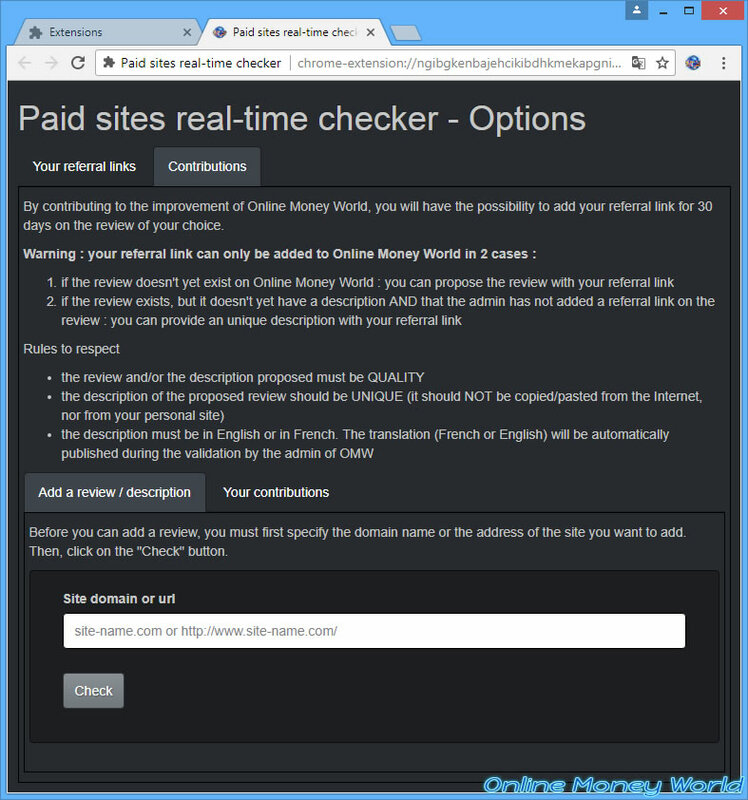 To add a review, as well as your referral link for the site presented on Online Money World, you must first download our "Paid sites real-time checker" extension. 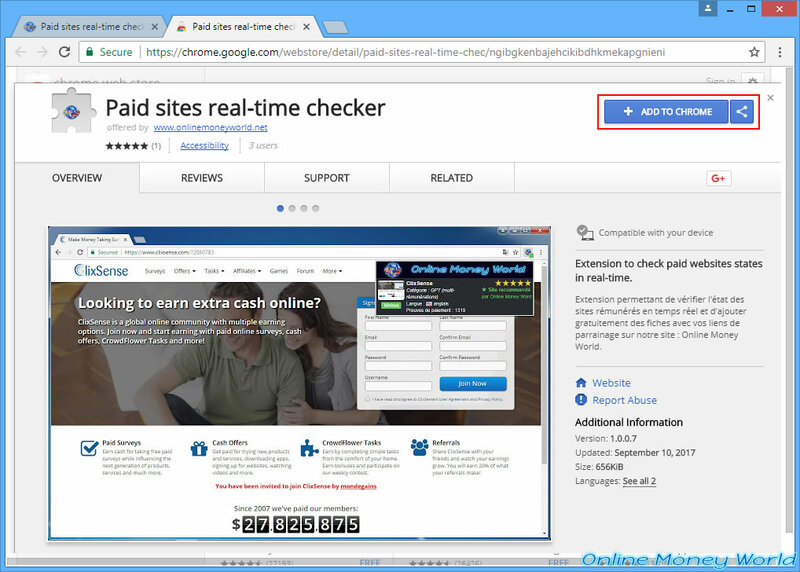 It's an extension to check in real time the status of paid sites you visit with your web browser. 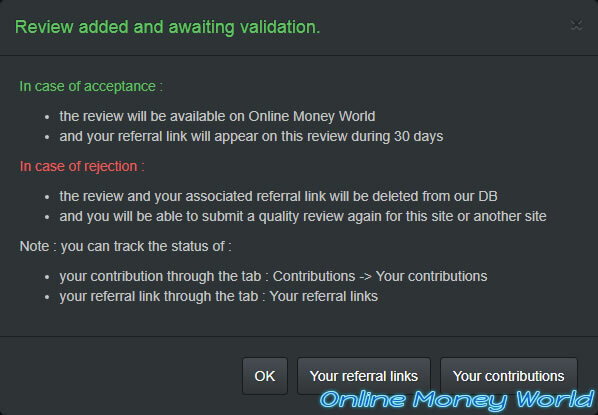 Once installed, it will also allow you to add reviews on Online Money World. To download this extension, you can click on the "Click here to get the extension" link available on the homepage of our site. The download buttons are available on the right (on large screens). If the installation doesn't start when you click on the Google Chrome or Mozilla Firefox button, go to the download page of our extension on the Chrome Web Store (for Google Chrome) or Firefox Add-ons (for Mozilla Firefox). 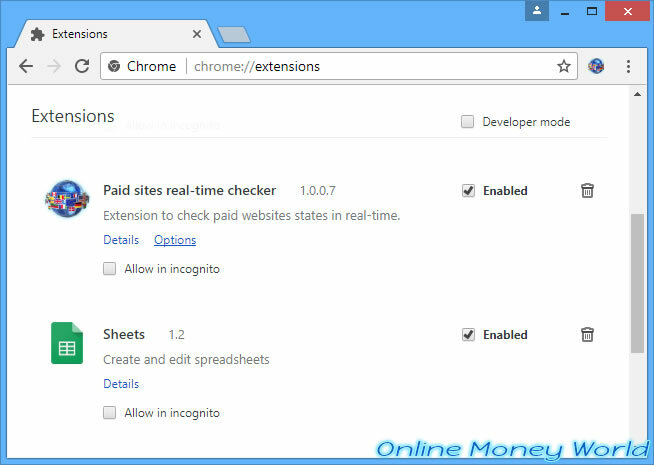 Here, we install the chrome version of our extension. Confirm the installation of our extension by clicking on : Add extension. Once installed, an additional icon will appear next to the address bar. When you visit a site, our extension will automatically check from our database if this site is a paid site (thanks to keywords) and if this site is already referenced or not. If the paid site that you visit is not referenced on Online Money World, you can add it by clicking on the "click here" link available in the "Online Money World" popup. Otherwise, you will need to access the options of the extension to complete our review and add your referral link on it. The "click here" link of the popup will redirect you to a special page of our extension where you can present the visited paid site. Warning : it must be a quality review and it must not be copied/pasted from another site (even if you are the author). For the description, it must be at least 500 characters and be written in English or French. Note : we will create the translation before validating your review. Once you submit your review, it will be encoded in our database and will appear only if we validate it. In both cases, you will be able to see the status of your referrals and your contributions directly from the options of the extension. Once validated, your review will appear on our site with your referral link. Please note that your referral link will appear for 30 days from its validation's date. When a user visits your review on our site, he will see a blue button instead of the usual gray button. This allows the user to know that the available referral link is not ours, but that of another user. Also, when flying on the "Access the site" button, the user will clearly see which address he will be redirected to. 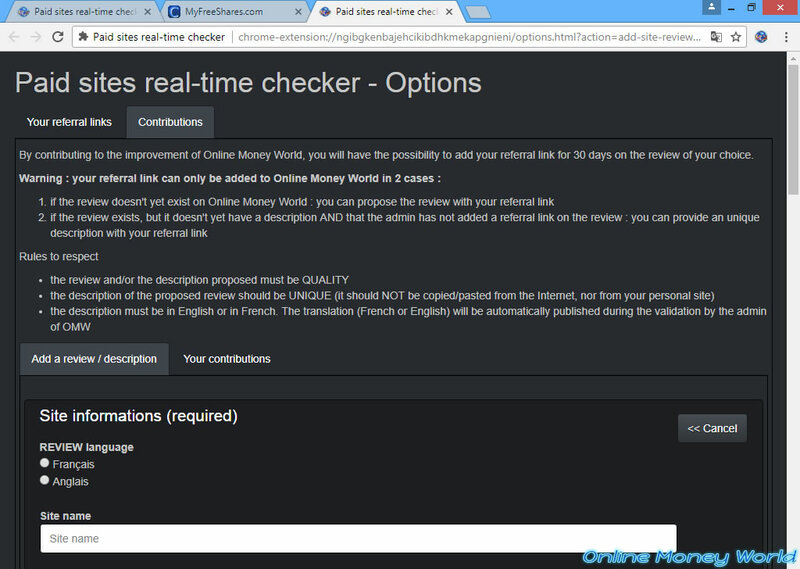 If the paid site or the autosurf is already referenced on our site, but there is not description for this one yet, you will be able to complete our review by going through the options of our extension. 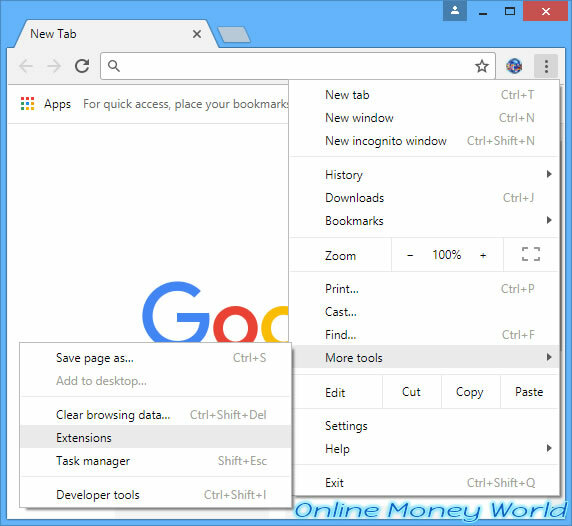 Under Google Chrome, open the menu and go to : More tools -> Extensions. 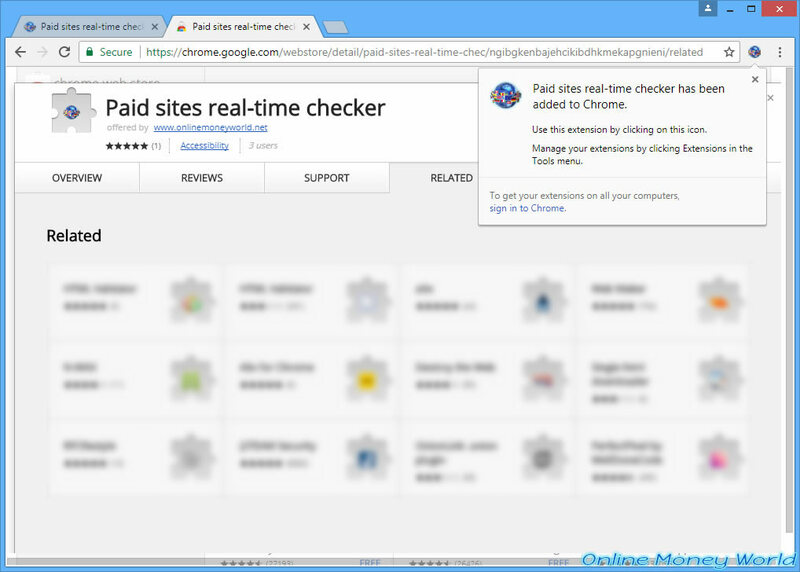 Locate our "Paid sites real-time checker" extension in the list that appears and click "Options". You will arrive in the options of our extension with the same options as earlier and in particular the possibility of adding a review or a description by specifying the domain name or the address of the concerned site. You will also be able to see the status of your referral links and contributions.